A MAN who crashed his van into a tree, killing one of his passengers, has been jailed for six years. Unemployed Michael Everson, 32, of Gravelly Crescent, Lancing, appeared at Chichester Crown Court to plead guilty to causing death by dangerous driving and failing to stop after a road traffic collision. 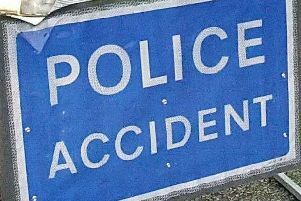 Everson had been at the wheel of a red Vauxhall Movano van shortly before 1am on Saturday, June 13 last year, when it left the road in Offington Avenue, in Salvington, and struck a tree. Passenger Samuel Frost, 27, of Chiltern Crescent, Salvington, died at the scene. Everson and three other passengers – one of whom was Mr Frost’s twin brother, a 32-year-old man from Goring and a 27-year-old man from East Worthing, all sustained minor injuries. Everson fled the scene on foot but was later traced and arrested. Sergeant Rob Baldwin, of the Sussex road policing unit, said: “Our investigation found that Michael Everson had consumed a mixture of alcohol, cocaine and cannabis in the hours prior to the collision. “At the time of the collision he was also carrying four people in the front passenger seats of the van which were only designed to safely carry two people. “His decision to drive the van that evening in such an intoxicated state, and with so many passengers, was highly irresponsible and ultimately led to the tragic death of Samuel Frost. Everson was also banned from driving for six years. He must take a mandatory driving test before regaining his licence. Anyone who suspects that someone is drink or drug driving is asked to contact Sussex Police, either by email on 101@sussex.pnn.police.uk, by telephone on 101 or by text on 65999. If a crime is believed to be taking place or about to occur, dial 999 immediately.